Snohomish County Bikes: an ongoing series highlighting great Snohomish County bike rides. Share your own great ride with us! Important to know if you’re fueled by calories: Which restaurants are open 7 days a week, like the Mirkwood in Arlington. Day 3 of our getaway from Seattle to Snohomish County offered us plenty of sunshine to make up for the soggy ride to Marysville on Day Two. Where to now? That was easy; I’d been to Arlington weeks earlier for the ribbon-cutting of a project that filled a gap in the Centennial Trail and wanted to head back. After chatting over breakfast with Swiss visitors who were heading off to hike Granite Falls, we rolled out around the lake. Once again, those flat miles on the Centennial Trail made it easy to plan, since it took us straight from Lake Stevens to downtown Arlington. Coming into Arlington you’re greeted by banners designed by local artists on streetlight poles, along with tile art set into an attractive stone wall. 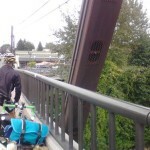 At the intersection of the trail and the parallel street 67th Ave. NE with Lebanon St., you can choose to stay on the trail, which has one little interruption at a set of railroad tracks where you’ll want to ride with care. Or take the on-street curve at the tracks right and you’ll end up on Olympic Avenue, which runs through the heart of downtown straight toward our destination: Mirkwood and Shire Café. This vegetarian/vegan restaurant/coffee shop/bar features kitschy Tolkienesque décor, a big venue for live music, some jewelry and art prints and notecards for sale — a funny and appealing mix. We sat outside on the wrought-iron furniture where we could see our bikes and look straight down the main street. 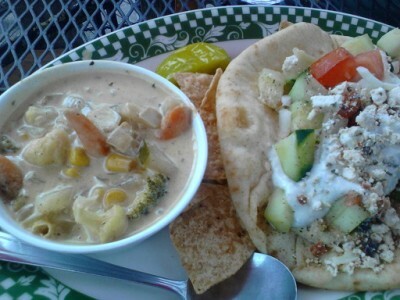 Soup of the day, curried vegetable, was creamy and delicious and my falafel came piled high with tomatoes and lettuce on fluffy pita. My husband enjoyed his panini sandwich with fresh basil, tomato, and mozzarella, and we topped off the meal with strong, hot coffee. Our wait staff said she sees lots of bicycle business, noting, “All the bike people sit outside.” She drives from Darrington to get to work and sees more and more bikes on the road all the time. When we visited they were planning some modifications to the layout that may be complete by now to have two spaces, one aimed more at the music-and-bar crowd, the other at the eat-good-food-and-talk crowd. Stop by Skookum Brewery for locally brewed beer when you visit Arlington, WA. I was sorry to see that The Local Scoop was closed as we rode down Olympic Avenue, as I’d had my tastebuds set for ice cream. Most of the shops were closed, as it was Sunday. Shopping and strolling: Arlington has a cute little downtown strip visible from and paralleling the Centennial Trail with several thrift stores and assorted other shops. I’m one of those people who loves secondhand stores; I’d much rather look at the items that embody the stories of people who’ve already lived than a rack or shelf full of identical brand-new things. And any town with a massage therapy school right in downtown has something to offer the passing bike traveler. Stop for food: Restaurants, saloons, and the aforementioned ice cream. Highly recommended by several locals and on our list for another day: Bistro San Martin, referred to as simply “the bistro.” Another option very close to the trail on Olympic: the Blue Bird Cafe, which gets high marks for breakfast in particular (expect a weekend breakfast crowd). Hubb’s Pizza and Pasta, at an intersection as you come into town, was the mustering point for the Centennial Trail ribbon-cutting June 2014. 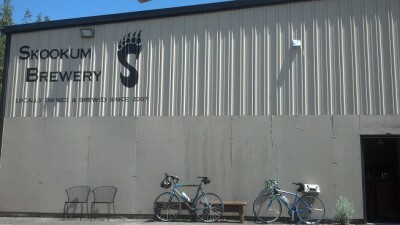 Local beer: A stop at Skookum Brewery before you head back to Lake Stevens takes you just a few blocks out of your way. Not a brewery, but a place to rub elbows with locals and shoot pool: Whitehorse Saloon next to the Blue Bird in downtown. Park, farmers’ market (and public restroom) on Centennial Trail: The Legion Memorial Park on the Centennial Trail in downtown provides a place to stop and hang out for a while with a pleasant gazebo and that essential trailside service: a public restroom. Saturdays July 1-September 1 it’s also home to the Arlington Farmers’ Market, 10am-3pm. Disc golf: If you’d like to get a different type of circular device flying besides your wheels, the Arlington Rotary Disc Golf Course awaits within a mile of downtown at Twin Rivers Park. Arlington Velo: Local bike shop in case you need any supplies or just want to check out the merchandise and talk bikes. Kangaroos! We didn’t know this or definitely would have petting joeys part of the trip. Outback Kangaroo Farm sits on Hwy 530 (Arlington-Darrington Road) so you’ll have to leave the trail, but it’s just a little over 2 miles from downtown. Note: This is the stretch of highway that was closed due to the devastating Oso mudslide in March 2014. It has reopened thanks to WSDOT’s stellar efforts; check the construction project page and images of Hwy 530 reconstruction. Smooth riding now and a nice shoulder, and someday the Whitehorse Trail will completely link Arlington through Oso to Darrington. Local farms: The Red Rooster Route takes you to family farms (including organic growers) and kid-friendly activities. 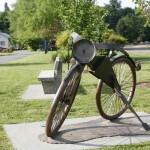 Local history: Stillaguamish Valley Pioneer Museum. Check their site to make sure it will be open when you’ll be there. Currently they’re open March-October, Wednesday-Saturday-Sunday, 1-4pm, closed certain holidays. Fly-In and Festivals: Experimental aerobatics are on display the second full weekend in July and area farms offer various festivals as their crops come into season. Make your reservations now if you want to catch the fly-in July 9-11, 2015. Keep riding! Head north of Arlington to the Nakashima Farm before turning around to come back. 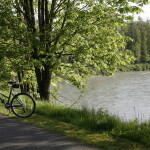 We also considered riding around Lake Stevens to the other side, where we would have had additional restaurant choices. Another incredibly quiet night’s sleep on a comfortable bed at the Mansion Inn Bed & Breakfast. Have your own bike travel experience to share? Write your ride — we’d love to publish it! 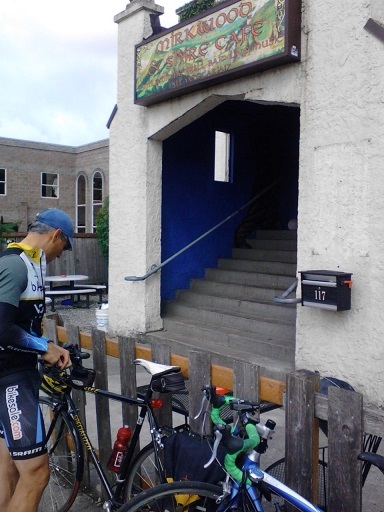 Want to make sure you get other bike travel stories from us? Sign up for our e-news. This article was posted in Adventure, Arlington, Darrington, Food, Kids, Lake Stevens, Oso, Snohomish County, Trails, Travel. Bookmark the permalink. Follow comments with the RSS feed for this post. Both comments and trackbacks are closed.